I'm so happy that the weekend is here. I get to spend some time with my girlfriend Krista and I'm soooo looking forward to our time together! We really don't get much accomplished stamping wise; but it's so fun to hang out and giggle with a fellow stamper.....can't wait!!!!! If you're wondering about my title....I lost my daughter's birthday card that I made for her! Bianca turned 9 on Monday and I couldn't find her card....looked everywhere and it's nowhere to be found!! I played it off pretty good by focusing on her presents & leaving immediately to go have some fun @ Haunted Trails. Just when I thought I was in the clear; she approached me and asked if I had made her a birthday card!!! "Of course I did" was my response, "I just can't find it right now!" She giggled & shook her head quietly saying "Mommy shouldn't hide things from herself because she *never* remembers where she hid them." Needless to say, I still haven't found it so I'm going to have to make her another card LOL! The one I posted today is her choice from last year. She picked the colors, dp and the image you see. I was a bit intimidated by her dp choice but the end result turned out pretty cute! Yaay me and keep your fingers crossed that I find her card really soon!! I have class today and will be finishing up my design team cards. Make sure you come back tomorrow to check them out and play along with us. I love seeing & commenting on everyone's beautiful work....don't let the challenges intimidate you LOL! What doesn't kill you, makes you a better stamper!!! Now THAT's funny! I can just see the expression on your daughter's face when you told her you can't find her card! I'm grinning from ear-to-ear! This one is wonderful. I love the colors and the frog! P.S. You KNOW you'll find the card about 15 seconds after you give her the new one you make!!!!! Cute card.. like the frog and the bling on the gift! 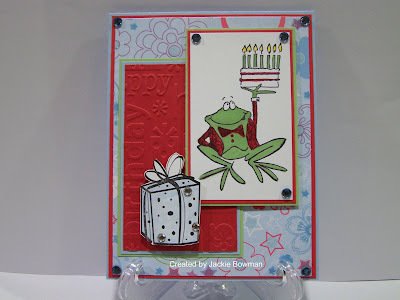 what a fun card.. the froggy is super cute ! What a cute, and fun card! I hope your daughter had a Happy Birthday! This card is adorable. I bet she really enjoyed it last year. I lost a card once. I finished it, put it down on top of my paper file and went to make another card. Half hour later, I reach to get the card and it's gone. I searched everywhere for it. I finally gave up. I found it almost a year later. It had fallen in my true thyme cardstock folder. Apparently I hadnt' used that color in a long time or I would have found it sooner. That is absolutely me! LOL...I feel your pain...LOL... love the frog card from last year...too cute! I love that froggie image! Great choice of paper. I do love the Dsp your daughter chose. What a cute idea to add that present. LOL! I can't find stuff I hide either. This card is too cute. I love the layout and colors. Fantastic! Isn't it amazing how smart kids can be....I hope you can find her card soon!! I love the little frog with the birthday cake...sooo cute and such beautiful coloring!!!!!! Oh my, I know what you mean about misplacing the card!! My Mom used to hide gifts (before the occasion) from my sister and I...when we got older, we would give suggestions of where she should go look!